It's only a few months until John and I will be moving into our first home together. It's coming up fast and I've started to think about things we might want to do with the house to turn it into a home. 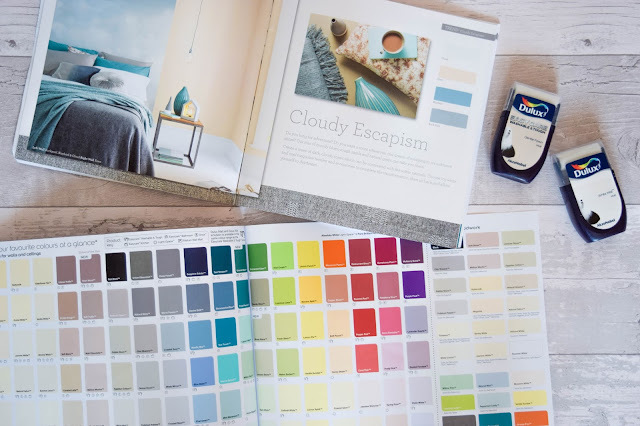 We know we want to paint and we've talked about the colour schemes we'd like for our living room and kitchen but one of the rooms I'm keen on getting a colour scheme for is our bedroom. It's such an important room and it's one I want to make sure we get right. We both have different ideas of colour schemes and want we'd like our bedroom to look like but I'm determined to find a colour scheme we'll both love. For me, it's important that our bedroom is cosy and relaxing place to be for both of us. A room we're happy to wake up in and just as happy to fall asleep in. I want us to sleep here in absolute bliss, and I want a bed that feels and looks like it's absolute bliss to sleep in too! John and I have been talking about beds and debating whether we should keep his bed or buy ourselves a new one. We're on the fence but definitely leaning more towards getting a new one. I showed him Bed Guru who have a brilliant and wide range of upholstered beds and are a new campaign called the #FabricGuru campaign, because they understand that people need a variety of choice when it comes picking a new bed. They know that no two people share the same sleeping requirements and whether it's down to size and/or colour, Bed Guru have a wide variety of choice so that you can add a touch of luxury into your bedroom with it's centre piece. I'm most definitely keeping these guys in mind when it's time to get our bed, especially because this one's my favourite. In my head, I've been toying with the idea of a either a light monochrome colour scheme with a pop of colour (usually injected with decor and bed sheets) or a more coastal blue colour scheme. 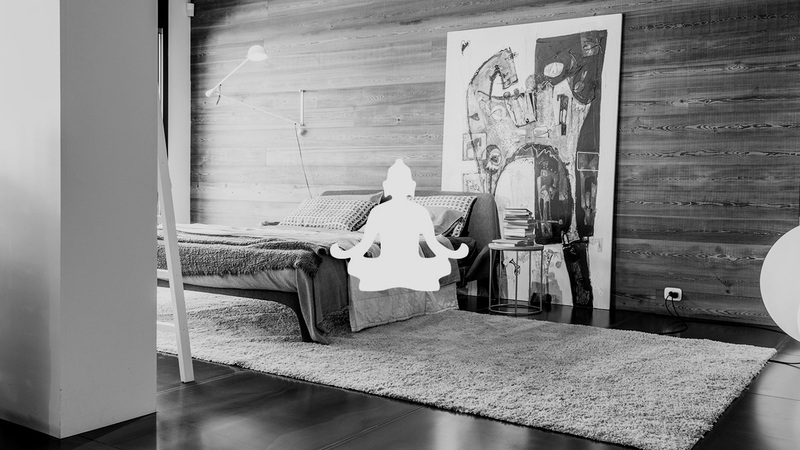 I want the room to feel light and airy, but warm too. I've been inspired at a few places. I recently picked up some colour magazines from Wickes to have a look at and I've inspired by the suggested colour schemes in them. I've also been looking an Pinterest for a few months too for ideas on colours, furnishing and decor. I feel the coastal blue colour scheme's also come from my love of the seaside. I can't just go whenever I want to so I'd love to bring a bit of the seaside home I guess. But I also love a monochrome look because it's so versatile and you could change it in so many ways as often as you like. Anyway, instead of rambling on about my colour scheme ideas, I thought I'd show and share my inspirations with you and see what you think! 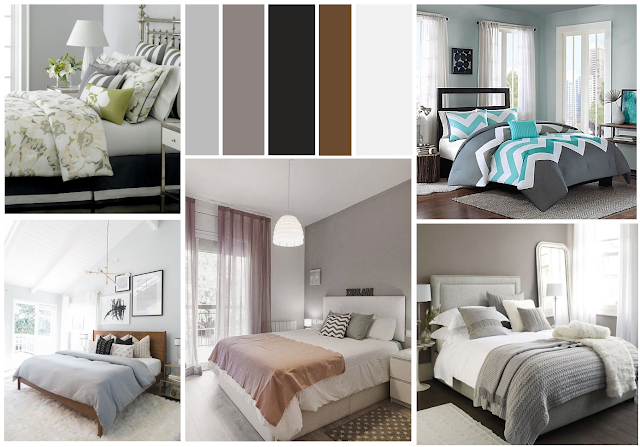 So, when I think of a monochrome bedroom, I imagine a grey upholstered bed and either grey or white furniture. I love the idea of having a big mirror leaning against the wall and some white bedside lamps. I didn't like the idea of an ottoman at first but once I thought about it, I think it'd be great for storing linens and towels now! This is probably the colour scheme I've been thinking about most but I don't want it to look boring and generic, you know? You can definitely see I'm inspired by the sea here. 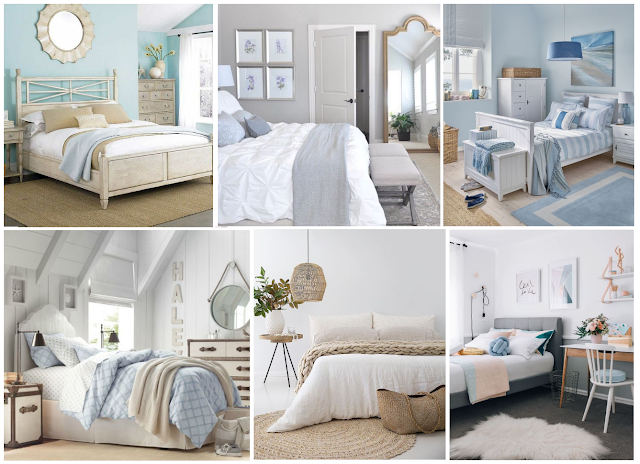 I'd probably still love to get a stone or calico upholstered bed and then have light wood or white furniture and decor that hints 'seaside' or 'coastal'. I love this colour scheme because the beach is my favourite place ever, but it's one I think is more me than John and me. That said, I'm going to show these to John and see what he thinks! Which colour scheme do you like best? Would you go coastal blue, or monochrome?